Huawei is trying to steal some thunder away from Apple’s iPad Pro event from tomorrow, by holding its own Honor tablet event on October 31st. It’s actually the Honor sub-brand holding the event, focused on the Magic 2 handset. The WaterPlay 8 tablet feels like an afterthought, but we’ll detail it anyway. By the way, just so you know, we should also see a brand new Honor Watch and the Honor FlyPods wireless earbuds. 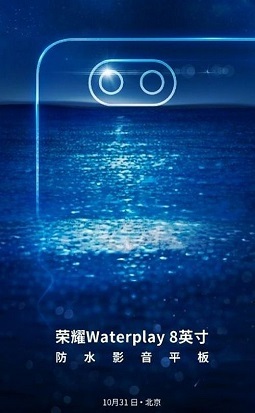 Honor WaterPlay 8 is a smaller version of the Honor WaterPlay tablet, that was announced last year together with the Honor 7X handset. Last year we got a 10-inch model, but the new unit will have an 8-inch screen. The post that teases the product launch also shows dual back cameras, something you don’t see on modern tablets. The device is expected to be waterproof, just like the 10-inch and just like the name hints. Sadly we don’t have a specs list, but we can speculate according to the last year model features. That one had a 10 inch Full HD screen, a Kirin 659 CPU, 3 or 4 GB of RAM and 32 GB or 64 GB of storage. There’s an 8 megapixel back camera on both sides with Bokeh support (both of them). A front side fingerprint scanner and a 6660 mAh battery round up the list, plus Android Nougat. The newcomer should have a smaller battery and Android Oreo at least.